We like our trips to the Scottish Islands and on 23rd April 2014 Peter and Kevin had a very early start from our showground in Low Hesket to reach the ferry terminal at Kennacraig, in time to catch the 1pm ferry to Islay. They arrived at Port Askaig, Islay at 3pm and set off for their destination Port Wemyss. 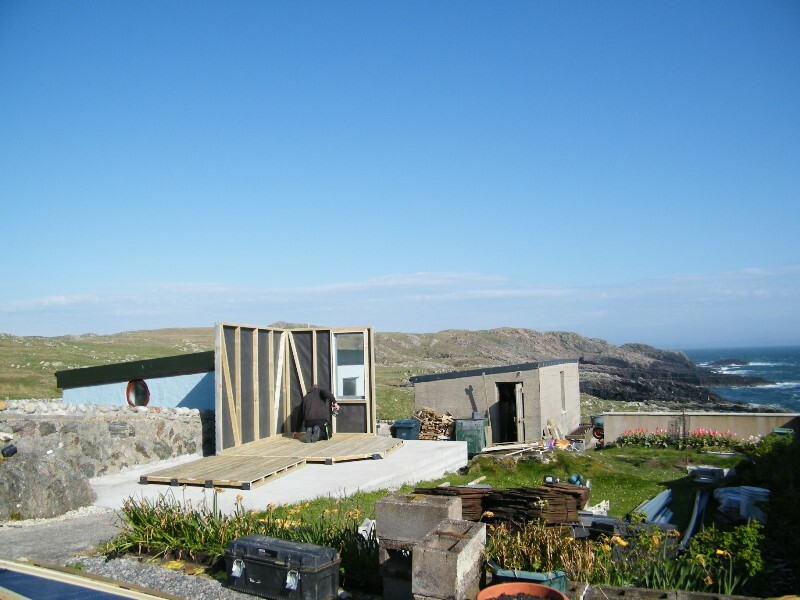 There was blue sky on arrival and a previously prepared concrete pad which meant Peter and Kevin were able to erect the shell of the building before retiring to their accommodation for a well-earned meal and rest. The next day, the work continued. 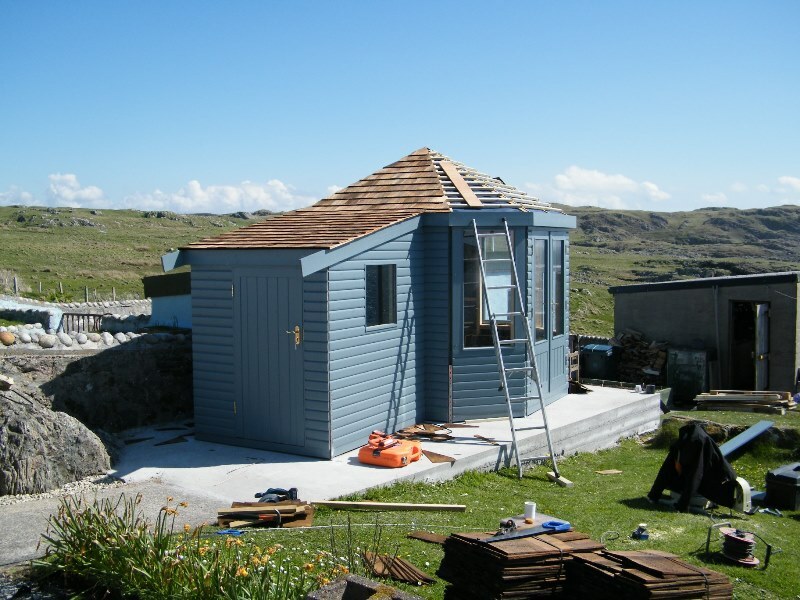 The roof was latted in preparation for the Cedar Shingles to be nailed on. 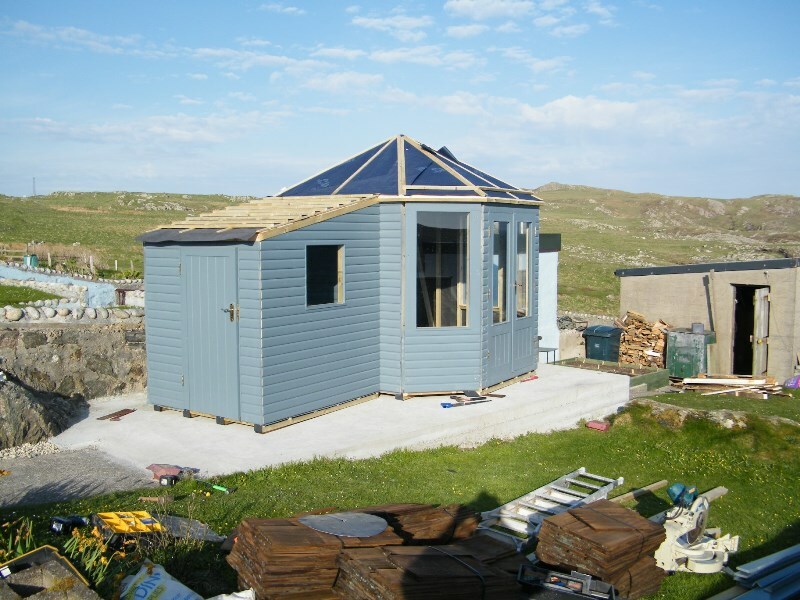 The roof needs to be well fastened down to withstand the 100 mile an hour winds which pound the coast. A ball finial finishes off the roof perfectly. 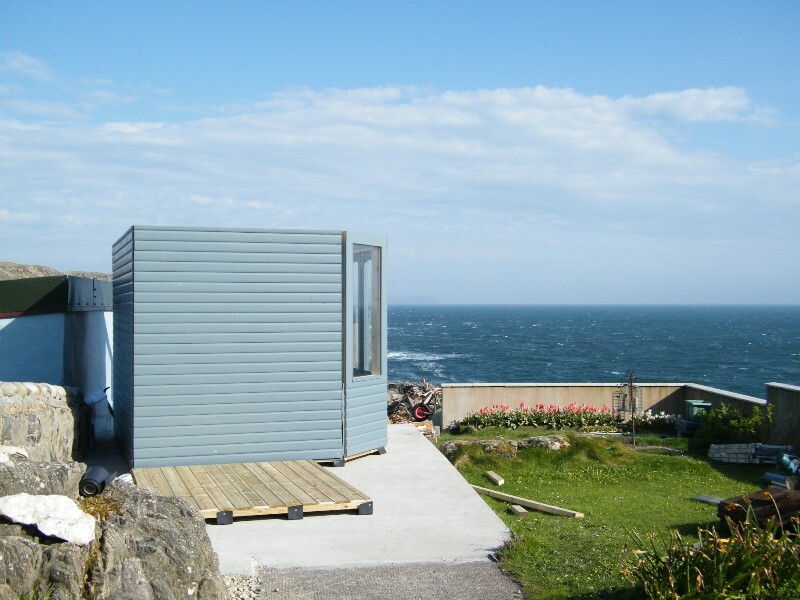 The Bespoke Summerhouse and Shed combination building stands in a stunning location with uninterrupted views of the sea giving protection from the wind and rain but enabling the owners to enjoy the beautiful natural landscape. The whole building was anchored down for stability and we used stainless steel nails and fitments to prevent rusting. Internally the walls of the building were lined with vertical Redwood T&G boards. Being in a conservation area the finish was important and the colour of paint chosen was ‘Wheelbarrow’. 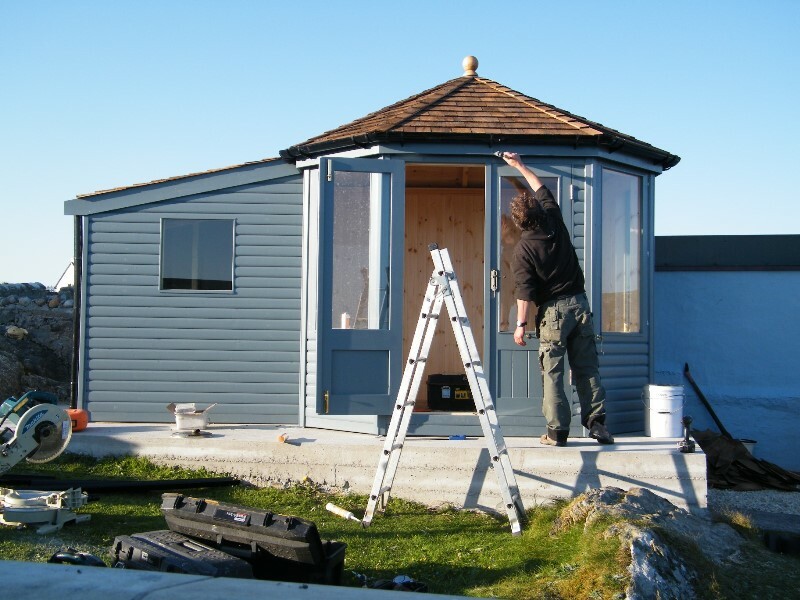 It is from the National Trust Garden range of colours by Farrow and Ball and fits perfectly with the surroundings – when the sky is blue it shines and when the sky is grey it blends in. 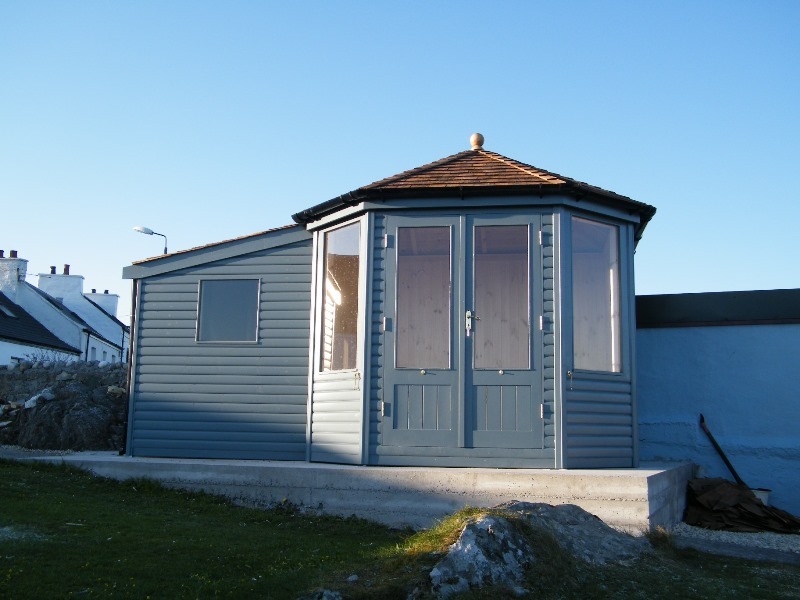 The attached shed offers great storage and flexibility.